This lampshade is handmade to order using a genuine flock designer wallpaper. 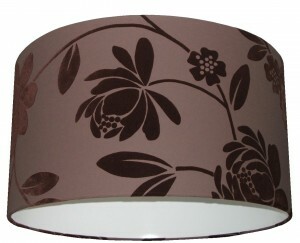 A floral trail, soft velvet feel flock in chocolate brown on a warm matte chocolate. The pattern continues right around the lampshade and top and bottom edges are hand rolled so that the pattern continues beyond the edge.